I had Bart wood and his Dad, plus Chris Fullilove and his friends on the boat on fri and sat. I had heard of a good wahoo bite on the lump so I went over that way to check it out and man they were right. 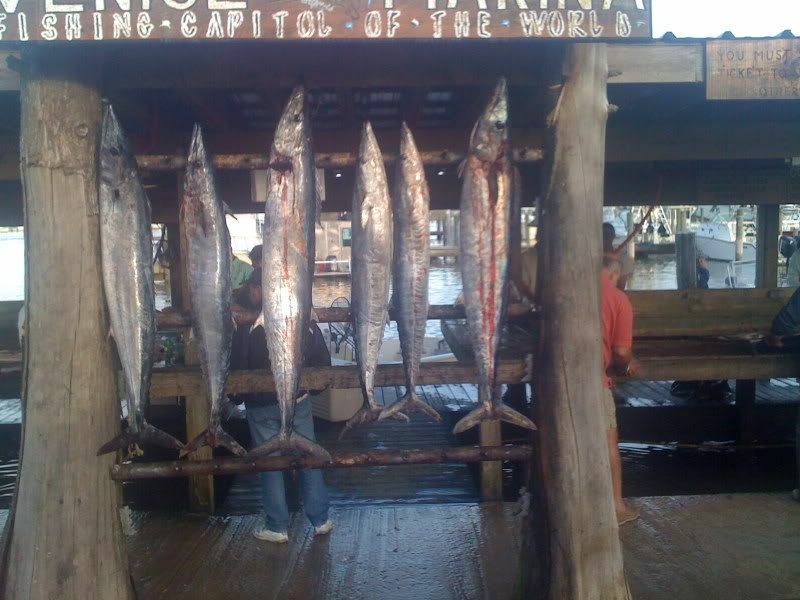 We started off hot and were catching doubles on wahoo and watching wahoo skyrocket everywhere. Every so often we would see a yellowfin bust as well and I tried drifting and chummig for them with no success. We were still picking away at the wahoo when we saw a huge school of big yellows come up. We trolled towards them and as we got closer they kinda disapeared. Then off the port bow we saw a couple fish bust and I threw an OTI popper into the fray and instantly a very big yf skyrocketed with my lure in its mouth. I figured we were going to have to fight this fish for a while but for some reason it never really decided to fight. About 25 minutes after we hooked it we put a 166 pounder in the boat using an OTI jigging rod, shimano spehros spinning reel, and an OTI Goanna popper. We ended up the day with 11 wahoo, one blackfin, and the big yeller. Here is some video of the yellowfin. On day two we were ready to see more yf jump and catch them and we didnt see any to throw at. 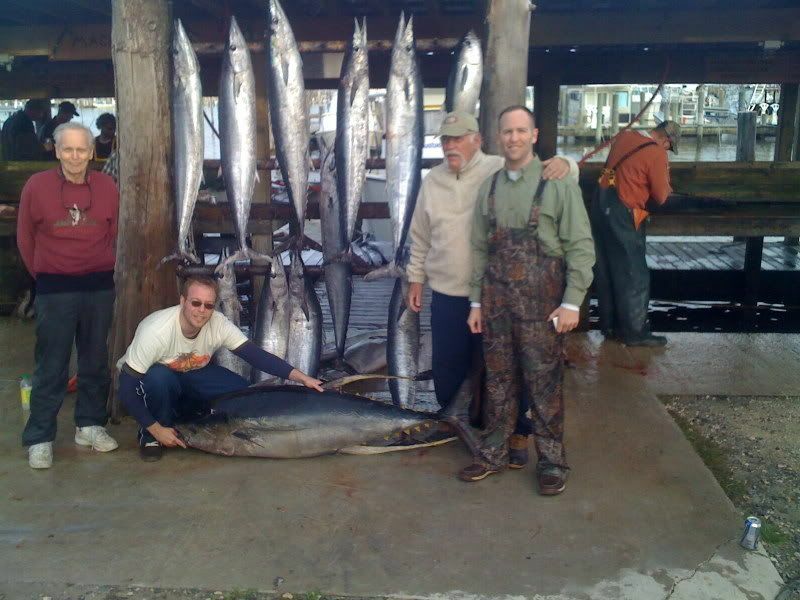 Oh well the wahoo were still cooperating. They had definitly slowed down but it was a decent bite. We picked away at them all day and ended up with 6 wahoo in the box out of 8 bites. I was feeling pretty good about that ratio until the following day when all my hooks turned to rubber I guess. I had Kenny Flake and his friend Cody on the boat and we were after hooters again. we didnt look for tuna busting because it was so foggy I had to troll around the rigs and the lump by radar. We started out with a double and missed both of them. Then we had two more hits and missed both of them. I was starting toget frustrated but we finally put the 5th one in theboat. We fished the rest of the day and had 5 more strikes with one conversion to end up the day at 2-10 on wahoo. Same Lures, sames rods, same everythign as the previous two days we just couldnt get them to stay on teh hook for some reason. I had the saltwater cowboys from stillwater, ok in for monday and tuesday and we had a major slowdown on the fishing. On monday I tried to go where I had been going and it had just shut off. We only had three bites all day and put one fish in the box. It plain sucked LOL. On tuesday I went off in a different direction and man was it rough. We picked up on blackfin at our first stop and since it was too rough to actually run to the next spot I put the lures in and we trolled about halfway there we doubled up on some wahoo and put both of them in the box. Kept trolling and no more hits in open water. 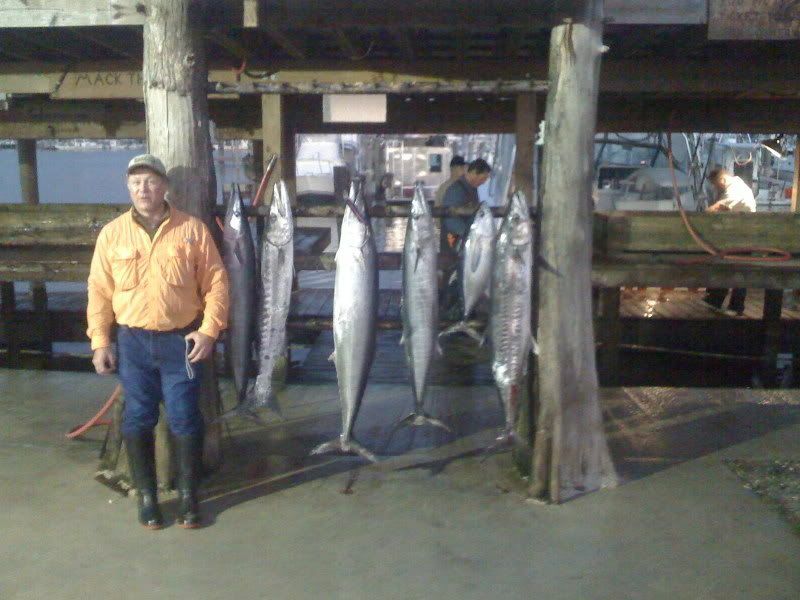 We had a few hits on teh rigs and managed to put one more hooter in the boat plus a really big king.